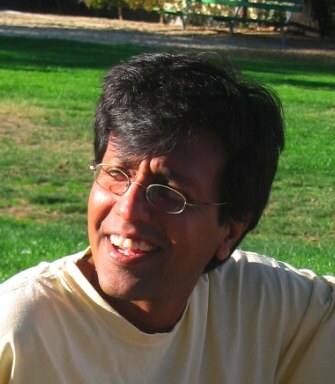 If you want the real story from a successful for-profit social entrepreneur, click the player to listen to Aseem Das talk about founding and transforming World Centric. Prefer MP3? Right-click and download. World Centric evolved from a nonprofit to a nonprofit with a revenue-earning component to a for-profit social enterprise. Today, World Centric makes fully compostable household products including utensils, plates and cups. You can find the brand in Whole Foods and Cost Plus World Markets and when you take out from your sustainable deli. It’s a profitable company rooted in a strong social mission. It’s a terrific story to profile this week on Cause Capitalism as I’ve been focusing on social business ventures. Aseem Das founded World Centric as a nonprofit organization with “a mission to reduce economic injustice and environmental degradation through education and community networks.” He knew he didn’t want to take the rote nonprofit funding approach–donor solictitations and grant proposals–so he looked around for a revenue stream that was aligned with World Centric’s mission. He dismissed mattress recycling and wind energy in favor of selling fair trade and compostable products online. In the process of applying for tax-exempt nonprofit status (501(c)3) sales of fair trade compostable products picked up; the organization was earning too much revenue to easily earn 501(c)3 status. So in 2009, World Centric fully converted to a for-profit enterprise selling compostable products. “It clicked that we could still do what we wanted to do as a for-profit,” says Aseem. The company is still focused on its social and environmental impact. It works toward being a model for sustainable enterprise and to influence consumers’ consumption and waste behavior. Aseem feels World Centric is able to reach a larger market segment than it would have as a nonprofit. But the current challenge is using this opportunity to educate consumers about the environmental and social issues core to the company’s mission. Aseem decided against taking funding and has been able to grow the company through sales. “We’re 100% in control of what we do with the business.” The tradeoff for independence is lack of resources, which adds to the challenge of balancing a social mission with profitability. Aseem now spends more time growing “the business side of things” than running the educational programs on which World Centric (.org) was founded. But it seems Aseem’s constant juggling of mission and financial sustainability is working. World Centric’s social mission helped the enterprise win larger accounts and gave it more room to build up operations and test the market as a nonprofit. The company has a carbon-neutral supply chain and operations, gives 25% of pre-tax profits to grassroots groups annually, heavily discounts products for schools and nonprofits, powers its offices with wind and solar energy, and offers employees a $250 monthly transportation stipend. Now, its new retail line opens up the opportunity to educate and influence consumer behavior through packaging and marketing. If you like this interview you should thank Aseem on Twitter like this. You can follow World Centric at @WorldCentric. World Centric products are made with annually renewable resources like corn, sugarcane and wheat straw fiber. Sugar cane and wheat straw fiber are also discarded by-products of the agriculture industry, and it uses this discarded fiber to make sustainable alternatives to plastics and styrofoam. It began with Freedom Now a nonprofit for MIA Vietnam veterans and that led to an invitation from President Clinton to serve as a volunteer on the steering group for his re-election committee. The white paper for a for profit approach was the result of that appointment and was described as people-centered economic development which remains the same of the organisation which has applied profit for social purpose in Eastern Europe over the last decade. Jeff, so interesting. Why did you decide to change models? How does the organization earn revenue now? I’ve been following your comments here and on other blogs and really enjoy and respect your perspective. Our for profit approach delivered proof of concept in sourcing the Tomsk Regional Initiative for USAID in 1999 and went on to deliver a national scale strategy paper along with activism to raise awareness of conditions for abandoned disabled children in Ukraine. Profits also support our work at Sumy University on economics in transition and smaller commitments to community back in the UK. Olivia I had nothing to do with the original model or defining the for-profit. Terry Hallman had a MIA father in law and dug into his disappearance in Laos where of course US forces weren’t supposed to be. That gained him reputation and the Clinton invitation. I got involved in 2003 when Terry fasted for economic rights from a tent in Chapel Hill. He communicated with myself and Sen John Edwards, who he’d been “mentoring” on “Two Americas”. One consequence was P-CED in thee UK and the other was the Center of Poverty Work and Opportunity at UNC. His ‘Marshall Plan’ paper pitched for soft power investment from the US weighing the cost against a week in Iraq. and prescribed a model for a social enterprise innovation fund. I just finsihed reading another article where I got stuck becuase I couldn’t understand the structure of a hybrid or a for-profit social business model. This article and its comment helped clarify some of the unknowns I all. Thank you to the author of this article, it’s commentators, and Aseem Das the founder of World Centric.